STAR SV-38R Swiss Type CNC Lathe (used) New 2015 - Turret and Gang config, Y axis turret, chip conv, fire suppression, long parts ejection, HP cool system, Convertible to chucker mode, TONS OF TOOLING, Presetter, LOW HOURS. 2016 Tsugami B038T ONLY 1073 cutting hours on Main Spindle Absolutely Mint!! Complete with tooling shown in Pictures and Patriot 338 barfeed! CITIZEN E32-IV Swiss Type Twin Turret Lathe (used) with Y AXIS TURRET, New 1995, w/Iemca Boss 542 Magazine Bar loader w/misc guide channel and pusher sets, Live and static turret tooling, High Pressure Coolant System, ran oil, manuals. CITIZEN L(6)32 VII (6M7) Swiss Type CNC Lathe (used) New 2003 w/LNS Express 332 magazine bar loader, WINDOWS BASED Control, adaptable for live back working attachment, Mist Collector, High Pressure Coolant System, Fire Suppression System, ran oil, well maintained, misc tooling. 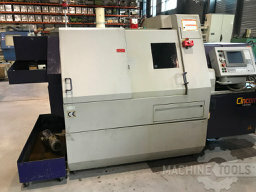 CITIZEN M32 III (2M3) Swiss Type CNC Lathe (used) New 1999 w/LNS Mini Sprint S2/32 Magazine Bar Loader (12' bars), High Pressure Coolant System, Mist collector, parts gripper and gantry ejection system, turret and gang, turret tooling, ran oil. Very well maintained. HANWHA STL-32H Swiss Type CNC Lathe (used) New 2014 - Gang slide and turret configuration, LNS Express 332 magazine bar loader, High Pressure Coolant, turret tooling - live and stationary, chip conveyoer, part conveyor. STAR SR-32J Swiss Type CNC Lathe (used) New 2008 with LNS bar loader, high pressure coolant, mist collector, live back working, ran oil. STAR SV-32 Swiss Type CNC Lathe (used) with Y axis turret and gang tool configuration, New 2004 w/LNS Bar Loader, live and stationary turret tooling, Fire Suppression System, ran oil, tool kit, manuals. 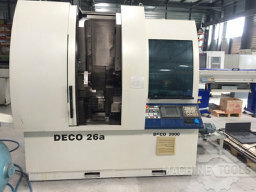 TORNOS Deco 2000 26a (32mm) Swiss Type CNC Lathe (used) New 2001/2002 w/FMB/Robobar SSF-5-32 magazine bar loader, tooling, collets, presetter, 12K power on hours only!, high pressure coolant system, mist collector. CITIZEN A32 VII (1M7PL) Swiss Type CNC Lathe (used) New 2010 w/C332 magazine bar loader, (6) NSK High Frequency Live Spindles, Live Back Working Attachment w/ speeder spindles, high pressure coolant, mist collector, parts conveyor, chip conveyor, ran oil, low hours. Motorized rotary guide bushing. 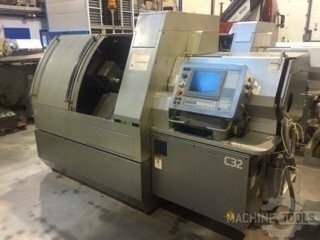 Citizen C32 VIII (1M7) Swiss Type CNC Lathe (used), New 2004, Equipped with: Mist collector, Iemca Boss 547 magazine bar loader, sub spindle, live tools, Manuals and tool kit. CITIZEN E32-III (2M3) Swiss Type Twin Turret Lathe (used) New 1995 w/Iemca Boss 542 Magazine Bar loader w/misc guide channel and pusher sets, Live and static turret tooling, High Pressure Coolant System, ran oil, manuals. Including IEMCA bar feeder, this machine is in good working condition and available for inspection! CITIZEN M(3)32 V (3M5) Swiss Type CNC Lathe w/turret and gang tool config with Y AXIS TURRET! New 2009 w/LNS Express 332 magazine bar loader, High Pressure Coolant System, Mist Collector, Fire Suppression, Part Conveyor, turret tooling, collets and bushings, ran oil, low hours.